Vetalogicas health treat range is Australian made and owned, and all their products are scientifically formulated after years of research. With input from scientists, chemists, veterinarians, and flavour experts, and the use of natural ingredients, you can be sure youre giving your pet the best quality health care. 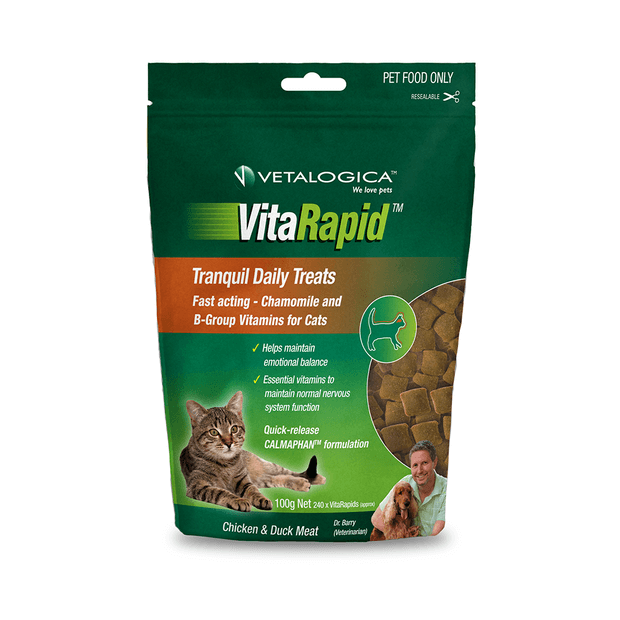 VitaRapid Tranquil Daily Treats for Cats works by delivering natural ingredients plus chamomile and B Group Vitamin Complex to maintain an ideal emotional balance. Vetalogicas unique Calmaphan blend helps to maintain normal nervous function in cats and unlike other supplements, is easy to give as there are no pills or tablets involved. Instead, this calming supplement comes in the form of a scrumptious treat that your cat will love. These treats are delicious tasting, with real australian chicken and duck meat, and contain no corn, wheat, rice or artificial colours and flavours. For ideal use, combine with Vetalogica Tranquil Formula for Cats. These treats are designed for supplementary feeding and do not constitute a complete and balanced diet. Looking for a different supplement? See all Vetalogica Health Products. Learn more about how to manage anxiety in cats by catify-ing your home. I bought this for our cat when we moved house. She was very unsettled and would not stop meowing, so much so that she lost her voice! This was wonderful. It worked quickly and she ate it straight out of my hand. I just wish I bought it sooner. Highly recommend. So far, very good results on a 10yr old nervy boy. It remains to be seen how he will cope with Queenslands Summer storms. Will consider combining with the Tranquil Formula. Unfortunately my cat is very fussy and doesn't like them. I feel like they will work because people seem to have great results with them, but the trouble is getting her to eat them. If she is already feeling nervous there is no chance. Perhaps if i mixed them with something. They are a much better price than anything else on the market I've found. 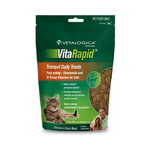 This product, combined with the Vitarapid Feline Tranquil Formula, is AMAZING! For 9 years, my cat was highly anxious, scared of everything (noises, people, movement), would hide away and 3 years ago starting over-grooming (OCD) to point she lost so much fur and was bare skin. I tried everything to no avail. Nearly 1 year ago, I started giving these treats to her. After 3 weeks of using both Vetalogica products together, I could see a change in my cat's demeanour. Within a few months, her fur had completely grown back, and she had calmed enough that noises no longer frightened her. She's purring so much and loving cuddles more now!! I can't recommend this product enough. It's changed my cat's life completely. She's finally enjoying her life without the anxiety and stress.